Your air conditioner’s the one thing that makes Brisbane’s hottest days of summer bearable. When your air conditioner’s working well, your home’s a cool haven from the oppressive heat and humidity outside. When it’s not, get ready for restless nights, frayed tempers and for your stress levels to hit the roof. If your air conditioner has ground to a screeching halt, or it’s limping along as though it’s on its last legs, there’s no time to waste. Is your air conditioner noisy? Does it rattle or gasp? Maybe it struggles to cool or heat your home when you need it most? Or has it just cut out suddenly? No explanation. No warning. Just a weird smell and a high energy bill. Sounds like it’s time to organise your Brisbane air conditioner repair or service visit? Even expertly installed air con systems and high quality products experience hiccups along the way; think about how often you use your air conditioner. The height of summer, the chills of winter, the unpredictability of spring and the up and down autumns Brisbane is so famous for – your air con is working overtime to produce conditioned air to your home or office. And sometimes, parts stop working. If you’ve experienced a problem, rather than searching endlessly online for terms like ‘Air Conditioning Repairs Brisbane‘, ‘Air Conditioning Repair Brisbane‘ or ‘Air Conditioner Repairs Brisbane‘, just give H&H Air Conditioning Repairs Brisbane a call on (07) 3276 1800 today. H&H Air Conditioning Repairs Brisbane are experienced in all air conditioning emergencies. Our rapid call out service will dispatch a highly trained repairs expert to your premises, armed with the knowledge to complete the job and restore the unit to full operation within a quality driven time frame. You don’t need to be an existing customer; we provide air conditioner repairs Brisbane wide, plus we provide Sunshine Coast air conditioning repairs from our local office on the coast. Curious about the air conditioning repairs Brisbane H&H process? H&H Air Conditioning Repairs Brisbane arrange a suitable date for a repairs assessment, as our technicians will diagnose the fault on-site at a time that suits you. If it’s a simple issue or we already have the part, our repair professionals provide a straightforward quote, fixing the problem then and there. If the glitch requires a special part, we will contact you once the component arrives on a Priority Service. H&H Air Conditioner Repairs Brisbane always strive to provide fast, efficient service to all of our clients; if we don’t have what your unit needs, you will be informed every step of the way until the task is complete. Suffering an injury or even an electric shock. Some air conditioning problems are serious and should have you searching for someone who does air conditioning repairs in Brisbane. Depending on your air conditioner, the troubleshooting hard work might be done for you. You might be alerted to the exact nature of the problem with an error code that appears on the display. You should keep your instruction manual close at hand. It will tell you what the code means and the steps to follow to fix the problem. The code, when read in conjunction with your instruction manual, will indicate whether it’s something you can fix yourself or whether it’s best left to a Brisbane air conditioning repair professional. Some of the most serious air conditioning problems are caused by electrical faults. They’re serious because of the risk of fire, injury or death. If your air conditioner has an electrical fault it’s something you should have repaired by an expert who is suitably qualified. So, what does an electrical fault look like in an air conditioner? Usually it’s characterised by an absence of power. The unit won’t switch on. The remote won’t work. The lights are off. There’s no error code to go by. It might seem obvious but ensuring that the batteries in your air conditioner’s remote control are working is your first step towards understanding why your air conditioner has broken down. You should also check that your air conditioner itself is plugged in and switched on. You also need to make sure that your air conditioner is not operating on timer mode. You’ve checked these things and it’s still not working? Time to look for other possible culprits. Normally, your air conditioner is hardwired in to your home’s electrical circuit. If your circuit breaker or safety switch has tripped, or if you’ve blown a fuse, that’s an indicator of a problem. If your safety switch or circuit breaker has tripped then you should be mindful that it’s doing its job and protecting you from electrocution. It could be that your air conditioner is overstressed or overheated. Or alternatively, it could also be because you have too many other appliances plugged in at the same time. You should allow your air conditioner to cool for 10 minutes before attempting to reset the circuit breaker and restart it. Unplug any excess electrical appliances. If, after doing this, the circuit breaker trips again, then you may have a more serious fault that needs professional investigation. Only a suitably qualified electrician or air conditioner repairer should attempt to repair an air conditioner with an electrical fault. Some types of air conditioners have a high-pressure limit switch which shuts down the unit in the event of an overload. You’ll often encounter this problem on an extremely hot day). You should check your instruction manual to see whether your air conditioner has this feature and if so, carefully follow the steps to re-set and re-start the unit. Corrosion (i.e. rusting) of your air conditioner’s wiring or electrical componentry can occur because of the moist and humid environment in which the unit is operating. This can also lead to electrical faults that may stop your air conditioner working effectively or at all. These problems should only be fixed by a qualified air conditioner repairer. Rodent damage to your household wiring can be one of the causes of air conditioner breakdown. If that’s the case, you need to take effective steps to eliminate the rodent problem at the same time as repairing the air conditioning unit. Failing to do so will just mean that you’ll be faced with a recurring problem, and one that could potentially lead to a house fire. Your air conditioner’s thermostat may be another culprit when it comes to Brisbane air conditioning repair problems. Think of your air conditioner’s thermostat as its temperature regulator. Its job is to measure the temperature of the air and adjust the operation of the unit accordingly. If the thermostat is faulty, set at the wrong temperature or has been inadvertently knocked out of position, your room might be too hot or too cold. In the case of a split system, your thermostat is normally inside your unit behind the cover close to the coils. Like any complex piece of equipment with moving parts, your air conditioner is susceptible to things wearing out and working loose. The fan belt and bearings are built to withstand significant friction but can still work loose and bring your air conditioner to a grinding halt with a succession of loud bangs or a screeching noise. Turn off your air conditioner immediately if this occurs. 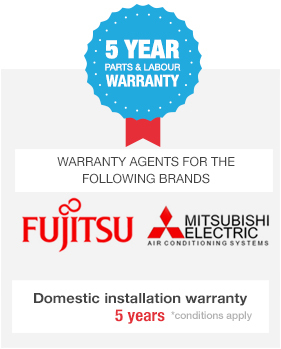 When you’re looking to buy an air conditioner you should always look for reputable, well-established brands that come with a warranty. Look for a brand with a proven track record of after-sales service. The reality is, you get what you pay for with air conditioners. The air conditioner you get for a steal online is invariably made from cheaper componentry and inferior materials. Buying a good air conditioner in the first place can mean the difference between getting a unit that’s built to last and withstand Australian conditions and one that will continually break down and cost you a fortune in repairs in the long run. Refrigerant is the lifeblood of your air conditioner. If your air conditioner is struggling to work properly, the problem might be able to be traced back to the refrigerant. Too little refrigerant (caused by inadequate charging at the time of installation or because of a leak that has developed. Your air conditioner doesn’t contain refrigerant prior to installation. Refrigerant is added at the time the unit’s installed. This should be done in accordance with the manufacturer’s specifications which set out the correct method and amount needed for optimum performance. If these specifications aren’t followed then your air conditioner won’t work properly and may even leak refrigerant. If your air conditioner’s leaking refrigerant it could also be a sign of potentially more serious problems. Simply adding more refrigerant won’t address the underlying cause. The leak needs to be traced back to its point of origin, repaired and the repair properly tested before you use it again. This is not something you should do yourself. Not all air conditioning installers are professional. Mistakes can be made in the Brisbane air conditioner installation process which will ultimately lead to your air conditioner breaking down. Kinks in pipework and cabling, or leaking ducts are just some of the examples of poor installation technique that can cause your air conditioner to operate inefficiently or even breakdown. An air conditioner that’s not installed in accordance with manufacturer’s specifications is a recipe for disaster. If you’ve got a ducted air conditioner, leaking ducts mean that your air conditioner will have to work harder than it should. It will wear out much quicker. Your unit may be producing sufficient cold air but the reality is that it’s pumping much of that cold air into your roof space instead of your rooms. You’ll have low air pressure, an overworked machine and much higher running costs than you should have. As much as you’d like it to be a set-and-forget cooling solution, your air conditioner needs regular maintenance from a professional in order to perform at its best. You need to check your instruction manual as to the manufacturer’s specifications in terms of regular maintenance, cleaning and servicing of your air conditioning unit. Neglecting your air conditioner will put you on the fast-track to an inevitable breakdown. Your air conditioner may be overworked and won’t be able to cope if it’s too small for the area it’s located in. You should check your instruction manual as to the size and capacity of the unit and compare it to the size of the room in which it’s located. If your air conditioner is clearly struggling with the demands of trying to cool too large an area, try reducing the area by closing it off from the rest of the house. You should also make sure that your windows are closed when your air conditioner is in operation. You also need to factor in ceiling heights when deciding which air conditioner is for you. The higher the ceilings, the more space to cool and the harder your air conditioner will have to work. An overworked air conditioner won’t be able to do its job properly, but the good news is that this is something you can try and rectify yourself. If your air conditioner filters or drains are blocked and dirty, chances are it will not run efficiently. It’ll run less efficiently and be prone to breakdown. One of the signs that you may have a blocked air conditioner is the formation of ice crystals inside the unit. Switch the unit off and allow sufficient time for the ice to melt. Regularly checking and cleaning your air conditioner’s filters is easier than you think. It’s also something you can do without having to call in the professionals. If you have a split system, you should inspect the unit outside so as to ensure that it’s clear from vegetation, spider webs, dirt and debris. Follow the instructions in your air conditioner’s instruction manual to clean the filters and replace them into the unit. Again, preventative maintenance and servicing is the key to detecting these kinds of problems before they take hold and begin to cost you serious money. Your air conditioner’s on the nose? If you suddenly detect a persistent burnt smell, there could be a significant problem. Call in a professional who understands air conditioning repairs in Brisbane. Blockages in the unit and, in particular, in the drain pipes, can also lead to your air conditioner becoming mouldy and that can cause a musty smell. Mould in your air conditioner is often a symptom of a bigger problem that needs to be urgently addressed. Leave it go and your air conditioner can become a health hazard, particularly if you or someone in your home has asthma or a respiratory illness. It’s worth getting an air conditioner repairer in Brisbane to take a look at the problems to ensure that any underlying cause (such as a blockage) is rectified. Sadly, there’s no air conditioner on the market that will last forever. Yours is no exception. It’s a complex piece of equipment with multiple moving parts. The combined effect of friction and gravity means that moving parts get worn out over time and will ultimately need replacement. Depending on the age of your air conditioner, there’s no guarantee that replacement parts will still be available by the time you need them. In some cases, repair is no longer possible and replacement is your only viable option. A suitably qualified and professional Brisbane air conditioner repairs service provider can explain the options open to you. Each type of air conditioner carries with it its own set of strengths. The downside is that they also have weaknesses, which leave them susceptible to problems, even breakdowns, in certain conditions. What Makes H&H Air Conditioning Repairs Brisbane Stand Out? At H&H Air Conditioning Repairs Brisbane, we are proud to offer customer focused air conditioning repair; our team specialises in assessing and repairing all air conditioning units, including split and ducted, and including brands like Fujitsu and Mitsubishi Electric. Don’t wait for good service. Call H&H Air Conditioning Repairs Brisbane today on (07) 3276 1800 in Brisbane and schedule your maintenance plan; the best repairs are those that were prevented by smart planning.